The time delay in 555 Monostable depends on the values of the timing resistor connected to its Threshold pin (pin6) and the timing capacitor to its Discharge pin (Pin7). Usually, the capacitor is connected to the discharge pin and ground to discharge its stored current through the discharge pin. 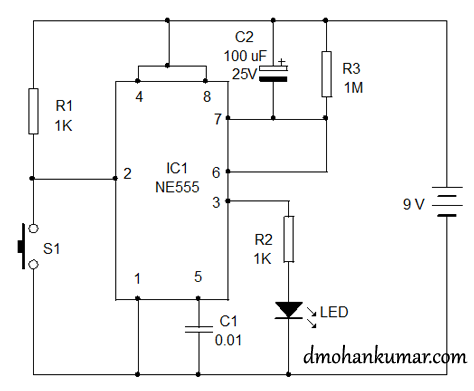 The time taken for discharging the capacitor determines the time delay. Just reverse the connection. The timing capacitor is connected between the positive rail and discharge pin. So the time delay depends on the charging of capacitor. It will take 6-8 times higher than the typical Monostable. Got the idea. 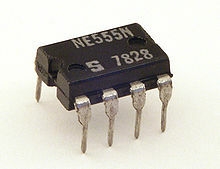 I got it while reading the properties of 555 timer. one more thing, dear DMK… if we use a calculator for count down application by using the enter key and the typed in number and + or – keys, and by giving 1pps/ required pulse to the enter key, it can be used as a count up or count down timer NS and any amount of numbers can be used, ie., programmable timer. i think it is very cheap and more flexible and on the other hand programmable too. how to connect a relay to it to cut off from the required circuit… is the main problem. hope u will comment on this. can you please suggest a circuit for the washing machine relay instead of the regular manual relay which costs more and is troublesome.